It’s like being a kid and finding the closet where mom hid all your Christmas presents – but BETTER. We got the inside scoop on some of the HOTTEST subscription boxes and what they are offering BEFORE they ship to members. Our collection this month has a very urban feel this month with a custom, street art-inspired print created by New York graffiti legend Stash. His first canvases were exhibited alongside the artwork of street art pioneers Keith Haring and Jean-Michel Basquiat. Stash’s love of urban environments comes through all of the art he makes, whether it’s his paintings or photography. We were lucky enough to not only collaborate with him to create this month’s print for our clothing, which features “Fabletics” incorporated into the graffiti, but to also have him contribute his art to our company’s café. Typically, most of us consider the laundry to be a drag. But what if it were an indulgence? The products in this month’s kit invite you to reconnect with a sense of gratitude at the joy of washing, to think of the laundry as a small, daily ceremony of renewal in harmony with the environment and echoing with the traditions of earth-centered livelihoods around the world. Use your laundry bag to saunter gleefully, and functionally, to the laundromat, basement, riverbank, or wherever your laundry journey takes you. The word laundry goes at least as far back as its lovely Latin root, lavāre–to wash. The act of doing the laundry connects us with our ancestors, while the products in your kit connect you to different ways this tradition is carried out around the world. Enjoy! After decades of poverty following the Khmer Rouge, a revival of traditional Cambodian arts and handicrafts is paving a colorful road out of the country’s dark past. Peace Handicrafts trains and employs disabled and underprivileged persons in the making of high quality products from recycled materials. For instance, your laundry bag was made from recycled cement bags. Birchbox has partnered with vH1 and Nicole Richie, Creative Director of House of Harlow 1960 and star of Candidly Nicole, to celebrate the show’s second season, which premiered July 29. The Bohemian-chic fashion designer, author, actress and television personality has added “Birchbox’s August guest editor” to her multi-hyphenate bio, creating an exclusive box filled with beauty samples that reflect the show’s theme, a “fresh take on funny.” Nicole-Inspired Birchbox products: Dr. Brandt Microdermabrasion, LAQA Cheeky Lip Tints in Humble Brag, OPI Venice Collection (one of four possible shades), Rene Furterer Lissea Leave-In Smoothing Fluid, St. Tropez Gradual Tan In Shower Lotion. Rachel Zoe is an unparalleled fixture in the fashion world – a distinguished designer, stylist and editor renowned for her effortless take on glamour, it is a given that her seasonal Box of Style is going to yield the most divine finds. The hero item for the Fall 2015 Box of Style has been leaked! 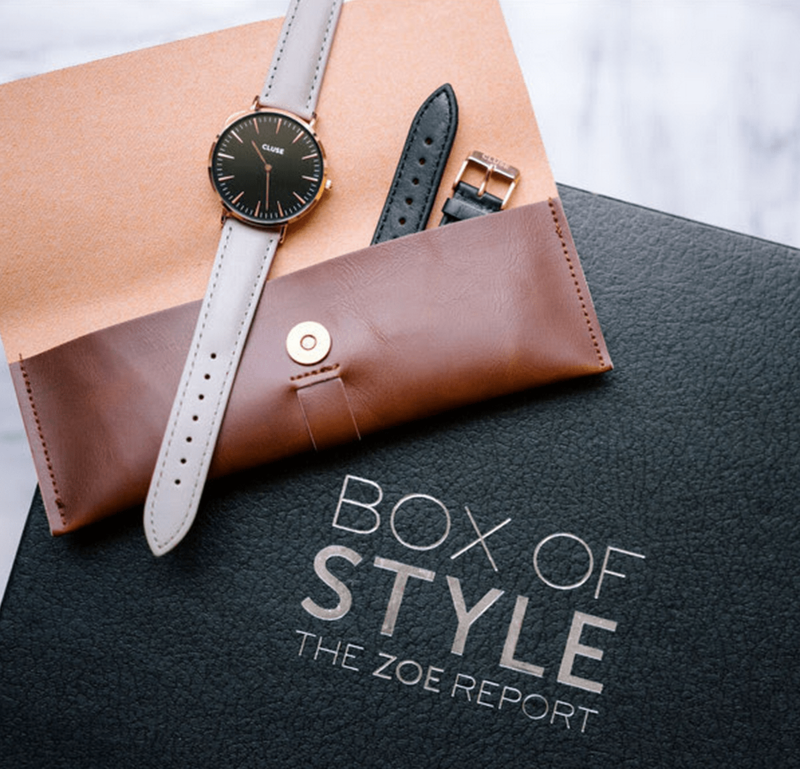 All Fall Style boxes will include CLUSE La Bohème rose gold watch with interchangeable grey and black straps. SEASONAL MEMBERSHIP: Box of Style ships 4 times per year—March, July, September & December – members are charged $100.00 / 4x year (for over $300 worth of product in every box). ANNUAL MEMBERSHIP: Box of Style ships 4 times per year—March, July, September & December – members are charged $350.00 / year (for over $1200 worth of product). Next Story → Beauty at it’s best: Top 5 Beauty Salons in U.A.E.